A recent National Research Council (NRC) report (2011) recommends that universities must craft policies and allocate resources to enable more university startups because some university technologies will never be commercialized unless licensed to a startup. However, the creation of university startups requires personnel skills and programs not typically associated with an university Office of Technology Transfer (OTT). Estimates show that 75 % of university inventions are not licensed at all. The conclusions of this study include university policies to turn some them to fuel university startups. Carefully selected case studies of three contrasting universities reveal patterns of successful startup policies and performance. MIT’s case is an example of long-term success, the University of Colorado’s case is an example of medium-term success, and Auburn University’s case is an example of a new-comer to the scene. Lessons from the case studies include: the need for very early evaluation of all inventions for their startup potential, the need for pre-license seed funds through proof-of-concept programs to advance early-stage inventions to the next stage, and the need for OTT personnel skilled in enabling startups. NSF’s recent I-Corps program invests heavily in the training of potential enablers and entrepreneurs for commercializing university inventions. Based on the findings of this study, I-Corps must also invest in pre-license proof-of-concept programs to advance early-stage university inventions closer to the market. Implementing the conclusions of this study would also accomplish the recommendations of the 2011 NRC report cited above. The author gratefully thanks the following for access to data through interviews and unpublished material concerning their university’s technology transfer and for taking the time to check the data presented in the paper: David Allen, Associate Vice President, University of Colorado, Boulder, CO; Katherine Ku, Director, Stanford University Office of Technology Licensing; Lita Nelsen, Director of MIT Technology Licensing Office; and John Weete, Assistant Vice President for Technology Transfer and Commercialization, Auburn University. Without their cooperation, this paper would have been impossible. Errors in the paper, if any, are entirely the responsibility of the author. The author acknowledges two sets of helpful comments of a reviewer that improved the paper. Chukumba, C., & Jensen, R. (2005).University invention, entrepreneurship, and start-ups. National Bureau of Economic Research (NBER), Cambridge, MA, Working Paper 11475, June, http://www.nber.org/tmp/60448-w11475.pdf. DeSimone, J. M., & Mitchell, L. (2010). 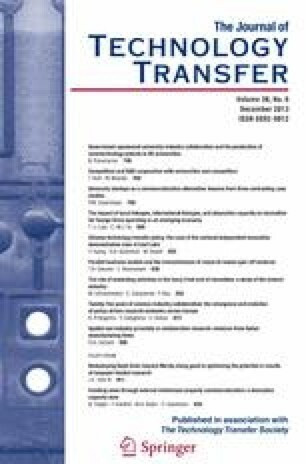 Facilitating the commercialization of university innovation: The Carolina express license agreement, Ewing Marion Kauffman foundation, April, http://ssrn.com/abstract=1585447. MIT TLO. (2010). Technology licensing office statistics for years 2000 to 2010 [ppt]. Cambridge, MA. http://web.mit.edu/tlo/www/about/office_statistics.html. Accessed 5/10/2011. Nelson, L. (2007). The activities and roles of MIT in forming clusters and strengthening entrepreneurship. In A. Krattiger, R. T. Mahoney & L. Nelsen, et al. (Eds. ), Intellectual property management in health and agricultural innovation: A handbook of best practices. Oxford, U.K.: MIHR, and Davis, USA: PIPRA, www.ipHandbook.org. Nelson, A. J., & Byers, T. (2010). Challenges in university technology transfer and the promising role of entrepreneurship education. Kauffman: Emerging Scholars Initiatives. Available at SSRN: http://ssrn.com/abstract=1651224 (July 1).